This immersive experience was crafted especially with people outside of the field of design in mind. Marketers, product managers, biz dev leaders, developers, and administrators - this is for you! Because we'll be working in small groups with facilitators, tickets for this event are limited. Early registration is encouraged. Amanda Pike is a Senior Experience Designer at Think Company, specializing in UX research and strategy. With a background in Library & Information Science, she’s been making sense of complex information in the digital space since 2008. In her role with Think Company, she works with clients across a wide range of industries and sectors to understand research goals, strategize on research approaches and methodologies, and execute research plans to uncover user needs, create user-centered solutions, and validate design concepts. As founder and creative director of creative incubator REC Philly—credited for its worthwhile events throughout the city—Will is doing his part to help creative entrepreneurs build and sustain professional careers within their industry. He is on the path to incite valuable change in Philly's art and music culture. Allison Hossack is Principal of Research and Strategy at Think Company. In her role, she ensures the successful execution of research to discover insights about user needs that inspire creative and effective solutions to enhance user experience. As a hands-on leader and problem solver, she savors big challenges and opportunities. Her user research has supported strategic initiatives, digital roadmaps, and product prioritization for companies spanning finance, energy, media, and healthcare including Johnson & Johnson, Transamerica, and Wharton University. Darian Davis is an Experience Designer at Think Company. In his role, he is focused on building evidence-based designs and crafting well-considered experiences. Darian has previously worked in the IoT industry crafting UX solutions for apps linking internet-connected devices for companies including ADT and T-Mobile. With a background in visual design, Darian maintains a balance of form and function in his design process, offering clients a well-rounded perspective when approaching new challenges. Ronethea Williams is the Founder of Field LabX, an experiential education company that facilitates global leadership and character development experiences. Programs are facilitated throughout the world and focus on skills and competencies like empathetic leadership and marketing in emerging markets. Ronethea previously worked in the talent development space, partnering with top MBA Programs and Fortune 50 companies to help thousands of millennial professionals realize their career potential. Check in and meet your cohort. Bring a pen, some paper, and a water bottle. We'll provide the rest! Get to know the team and our plan for the evening. Dive into concepts such as user-centered design and design thinking as the driving principles for the day. This lesson will focus on how to apply these principles to everyday business challenges, while focusing on one case study (REC Philly) which will drive our research efforts throughout the experience. Discover best practices for planning and conducting research. After practicing research skills, the group will work together to identify our research questions and hypotheses to test during the breakout sessions. Breaking out into small groups, we’ll go out into the field to observe and interact with our target audience. This lesson provides a hands-on opportunity to practice the research methods, skills, and techniques introduced in the previous section. After collecting your data in the field, we’ll come back together to make sense of your research findings, identify key insights, and translate those insights into actionable solutions. We’ll provide frameworks and templates for creating an innovation strategy and roadmap to share with the larger group. Each small group will present their research findings and pitch us their top ideas. This final lesson will focus on communicating your strategy and vision to get buy-in and support for your innovative solutions. Continue to meet, mingle, and collaborate with your cohort over light refreshments. 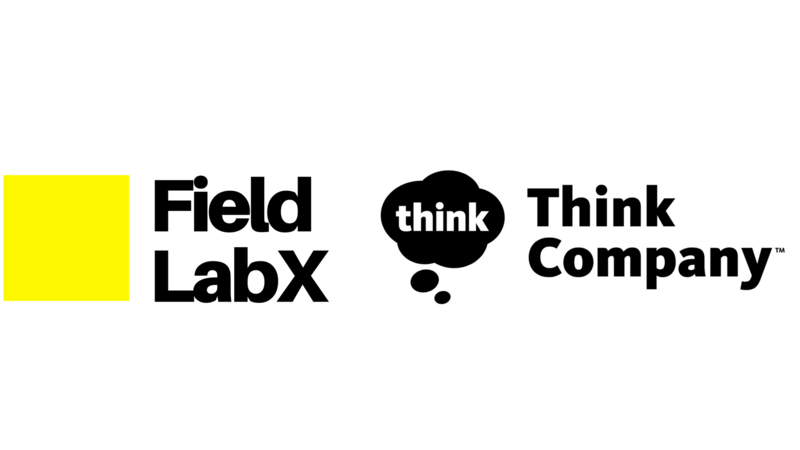 Think Company is an award-winning experience design firm founded in 2007, employing consultants across three studios with expertise in almost every industry. We pride ourselves on using a research-driven methodology which ensures our design decisions are always based on evidence. We specialize in research, strategy and visioning, content strategy, experience design, digital product design, and software development. We exist to help you create great experiences for your customers and employees. Field LabX is an experiential education company whose mission is to help professionals become more innovative and empathetic leaders. We believe that innovators with more situational and cultural awareness build better, more inclusive products and services. Our suite of programs include week-long global immersions ranging in topics from sustainability in Tulum, MX to Marketing in Emerging Markets hosted in Rio de Janeiro, Brazil. Join us for an evening of learning, iterating, and developing with some of Philly's most innovative leaders.